The U.S. Army defined a sniper in a 1944 field manual as "...an expert rifleman, well qualified in scouting, whose duty is to pick off key enemy personnel who expose themselves. By eliminating enemy leaders and harassing the troops, sniping softens the enemy's resistance and weakens his morale." This is in contrast with the ordinary rifleman, whose fire is rarely carefully aimed and is often expected to do no more than distract the enemy or force him to take cover or retreat. The sniper relies on surprise, and he shoots to kill, typically at medium to long range and from cover. As suggested by the U.S. Army definition, snipers often had an important secondary role in intelligence gathering on the battlefield. Although snipers could use standard issue rifles if necessary, they typically used rifles that were selected and modified for the sniper role. Whereas the ordinary rifleman required a weapon that was robust and easily maintained, capable of producing a high volume of fire, and appropriate for fluid combat situations, the sniper needed accuracy above all else. A telescopic sight and bipod were more trouble than they were worth for an ordinary rifleman in fluid combat, while a semiautomatic action made little sense for a sniper attempting highly accurate fire from a concealed position. The Japanese Type 97 sniper rifle was essentially a Type 38 with a telescopic sight, a modified bolt to clear the sight, and a wire monopod. There was also a sniper version of the Type 99. Marine officers observed that captured Japanese telescopic sights appeared to be superior to those available to American troops. British snipers used a standard Lee-Enfield rifle individually selected for accuracy and equipped with a telescopic site and other accessories. The American sniper used the Springfield 1903 with an optional telescopic sight. Snipers themselves were often little more than riflemen selected for their superior marksmanship, equipped with a sniper rifle, and deployed to the appropriate slot in a company TO&E. This was particularly true early in the Second World War. However, the British had instituted specialized sniper training by the time war broke out in the Pacific, and the Japanese also trained snipers during the war. The United States Army gave snipers only rudimentary training which emphasized marksmanship, while the Marines gave somewhat more thorough training to specialist scout-sniper teams. A Scout and Sniper School was established at Guadalcanal in September 1942 to train two snipers in each rifle company, plus additional snipers for a Scout and Sniper Detachment for 1 Marine Corps. In April 1943 a 43-man scout and sniper platoon was authorized for each Marine infantry regiment. U.S. Army doctrine declared that "Snipers may operate in pairs, in groups, or singly. Snipers may be employed by company commanders and platoon leaders in either the offense or defense. There are two types of snipers: mobile snipers and those who operate stationary observer-sniper posts." Mobile snipers were expected to rove the battlefield, infiltrating even behind enemy lines, and to approach their target relatively closely and kill with their first shot. Sniper posts were to be established at points with clear fields of fire and good concealment, including a concealed approach from the rear. Posts on ridge lines or in full sunlight were to be avoided. Telescopic sites were seen less as an aid to accuracy than as an aid to picking up obscure targets, such as camouflaged targets or targets during periods of reduced visibility. Where opportunities for long-range fire were not expected, as with a mobile sniper in jungle terrain, the sniper might dispense with the sniper rifle entirely and arm himself with a carbine, a pistol, or even an automatic weapon. Green troops often went to ground after one of their number was hit by a sniper, which simply gave the sniper a selection of immobile targets to pick off at his leisure. Experienced troops knew that the best chance to avoid being hit was to continue the advance. Eventually the sniper would either retreat or give away his position, and because a sniper could not produce a high volume of fire, a located sniper was highly vulnerable to being rushed or overwhelmed by superior firepower. One of the great bugaboos of the Guadalcanal campaign which slowed nearly all advances by the infantry was the belief, firmly held by nearly all troops, that Japanese "snipers" operated from treetops. But this belief, which the Japanese curiously entertained about American "snipers," was seldom supported by facts. 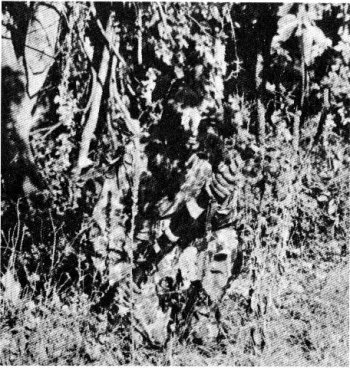 The Japanese rifleman was not especially equipped for sniping, nor did he usually climb trees to shoot. Anyone who has ever climbed a tree in the jungle can testify to the difficulties a man with a rifle would encounter — lack of visibility, tree limbs in the way, and the innumerable little red ants whose bite is like the prick of needles. The term "sniper" is used herein in the sense that became common usage as the war progressed. By "sniper" we mean any individual rifleman who delivers fire as an individual, and not as a part of a unit fire plan. A "sniper", therefore, need not be especially trained to serve a specific purpose. He may be located in any position--a tree, a hole in the ground, behind bushes, in buildings or equipment. He may choose any target that presents itself. He need not be guided by a time element in delivering his fire. His primary mission is to inflict the greatest number of casualties upon opposing forces, causing attrition in the ranks. Thus, any man spasmodically firing a rifle or similar weapon at another individual or group of individuals immediately becomes a sniper. Snipers were generally trained to target commissioned and non-commissioned officers, who could often be identified by their rank insignia, because they carried binoculars, map cases, or other distinctive equipment, or because their behavior or the behavior of the men around them gave them away. Officers often concealed their insignia and distinctive equipment, and troops were sometimes instructed not to salute officers while on the front line.